In an exclusive interview with Western Wire, Environmental Protection Agency Administrator Andrew Wheeler addressed Colorado’s challenging background ozone situation, including transport of ozone from other countries, along with exceptional events, in the light of Colorado’s move to end a request for an extension on meeting air quality standards. On Friday Gov. Jared Polis announced the state would withdraw its request for an extension on the 2008 ozone National Ambient Air Quality Standard. “This extension would have given Colorado additional time to come into compliance with the health-based standard. Colorado is choosing to move forward without delay to protect communities and their public health,” Polis said. “There’s too much smog in our air, and instead of hiding behind bureaucracy and paperwork that delay action, we are moving forward to make our air cleaner now,” he added. Last week Polis rejected overseas emissions as a basis for a waiver. “We can’t use pollution from China as an excuse not to improve our air quality here in Colorado,” said Polis. “And we know there is a large amount. Mercury, for example. The majority of mercury deposited in the United States comes from overseas,” Wheeler said. While some mercury falls back near the source, the majority can go up into the atmosphere and travel a great distance around the world, including ozonem he added. “We do a much better job at monitoring and modeling where pollution comes from and the impacts of the pollution. I would hope this state would take advantage of the advancements over the last 20 years in that regard,” said Wheeler. The recently confirmed EPA chief was in Colorado to announce the latest round of water infrastructure loans. “I believe that water issues, from drinking water to marine litter to infrastructure, are the largest and most immediate environmental and public health issues affecting the world today. The U.S. is and will remain one of the world’s largest donors and investors in the water sector,” Wheeler said. Wheeler announced the third round of loans under the Water Infrastructure Finance Innovation Act program at the Denver Water Recycling Plant in Commerce City, Co.
“We are here today at the Denver Water Recycling Plant to see first-hand the innovative ways we can maximize the nation’s precious water resources,” Wheeler said. “Water recycling is an issue that impacts the west most acutely, but it’s become the concern for other states as well,” Wheeler said. The administrator said the Government Accountability Office estimates that 40 out of 50 state water managers will face fresh water shortages within the next decade. Wheeler said that mobilizing capital is one of the biggest challenges for local communities, and the WIFIA program helps to provide long-term, low-cost supplemental loans for water infrastructure projects. To date, the agency has issued 8 loans for $2 billion, helping to finance $4 billion in projects and 6,000 jobs. A second round of 39 projects would leverage over $10 billion in water infrastructure and an expected 180,000 jobs. Wheeler’s Friday announcement of a third round would provide $6 billion in WIFIA loans to another $12 billion in investments and an additional expectation of more than 180,000 jobs. The loans will focus on shovel-ready projects in three main areas: water reuse and recycling, reducing exposure to lead and other contaminants, and updating the nation’s aging infrastructure. Those projects ready to break ground within one year would receive added attention. Earlier in the day Wheeler spoke at the American Bar Association’s environmental law conference in Denver. Wheeler also addressed methane at his stop in Denver. He said the agency was preparing to finalize a technical package and was also looking at an additional proposal in the next few months. “Methane is actually the product the natural gas companies are selling. We are trying to work more cooperatively with the industry to make sure the methane is captured,” Wheeler said, adding that methane emissions have gone down even as natural gas production has nearly doubled over the past two decades. “We’re looking to see what the industry is doing, how they are being more creative in capturing their methane. We want to make sure we’re not putting a different layer of regulation on top that is not as effective as some of the voluntary measures that some of the companies are already doing. Wheeler offered additional thoughts on the most pressing issue the world faces, water and water infrastructure. “One of the big problems we have on the water infrastructure side is coming up with the financing and the money to take care of the huge cost burden we have,” Wheeler told Western Wire. Wheeler said that many areas, like those in the Midwest, have aging water infrastructure dating back to the late 1800s. “They’re out of date and need to be completely revamped and there’s just not enough money to do that all at one time,” he said. 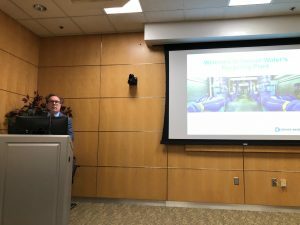 “Internationally, we have the marine plastic debris, which is the trash going into the oceans, and the lack of drinking water, potable water,” Wheeler said. He pointed to the deaths from a lack of sanitary drinking water and approximately 1,000 children who die each day from a lack of access to clean water. 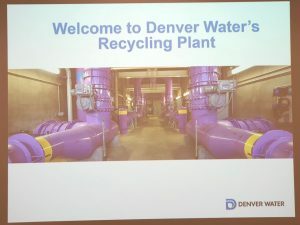 Wheeler said that water challenges start earlier in the chain, and that recycling challenges complicate the way that recyclable materials are handled, along with storage and other waste management. Finally, Wheeler also spoke to Western Wire about the recent elevation of EPA Region 8 Administrator Doug Benevento to Senior Counselor for the agency, a role starting on April 1, and the internal reorganization at the agency. “We’ve had ten incredible regional administrators in this administration. We’ve selected ten individuals who had experience running state programs to become regional administrators, and we’ve made a lot of progress over the last year-and-a-half trying to work more cooperatively with the states through our regions,” Wheeler said. “We’re doing a lot of innovative programs with our regional offices and the states, and what I’ve asked Doug to do is take on a broader role than to be the Region 8 administrator, and to work with all of our regions, our regional administrators, and headquarters staff to see the innovations we’ve made, the pilot programs we’ve launched, to see if we can take those nationally. A perfect example is what he worked on in the state of Wyoming on their audit MOU [memorandum of understanding],” he said. “We want to see if we can take that national,” Wheeler said. Wheeler said Benevento’s promotion comes as the EPA launches its regional reorganization plan to have regional administrations reflect headquarters. “That’s going to provide new real challenges for the regions, and I’m going to need an experienced person who understands state programs and understands and can work with all 10 regions to make sure that that program is implemented successfully, so I asked Doug to take on that new leadership role,” Wheeler concluded.